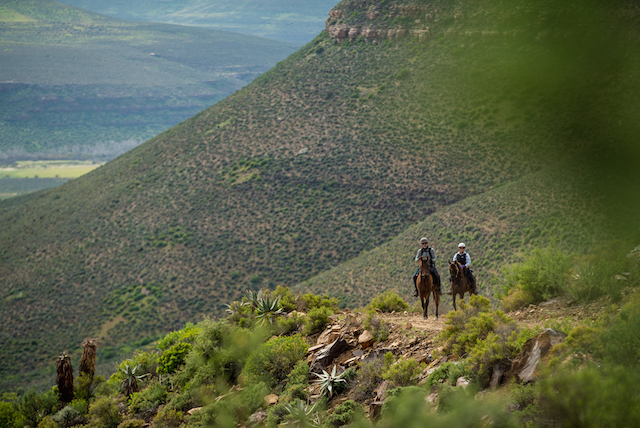 Our longest expedition, 435km in 13 days; from the imposing majesty of the Cedarberg and the Sutherland plateau to the stark beauty of the Tankwa Karoo desert flatlands, experience the incredible diversity of landscapes in this arid paradise. Cold, star bright nights beside the campfire punctuate long distance days. RIDE THE KAROO_v6 from Go Yonder on Vimeo. After arriving at out start point at Mt Cedar, a working kalamata olive farm, in the heart of the Cederberg range in the late afternoon (after a 2.5 hour transfer from Cape Town) there will be time to meet your horse before settling into your digs for the night, possibly after one too many marinated Karoo lamb chops perfectly roasted over the coals and one too many glasses of a delicious local red wine. On our first day on the trail we have an easy day winding up the steep sided Cederberg Valley on a narrowing gravel road with plenty of time to stop, tweak stirrups and take in the stunning scenery. We spend the night at another typical Cederberg homestead tucked away in the fertile valley. We remain in the valley for our second day of riding: it narrows and steepens and we travel on the narrow Pakhuis Pass on our way to the Old Rhenish Mission Station of Wuppertal before the landscape opens to reveal the lush Biedouw Valley, our destination for the day. If Mother Nature is being kind, in late August the fynbos will be in full spring bloom, with the countryside hopefully full of flowers. On day four we climb out of the valley on the old postal route between the Biedouw Valley and Eilandsvlei onto a flat plateau over looking the Tankwa. In terms of distance it is a short day but the climb is steep and the horses need be rested for the long ride into the heart of the desert the following day. We spend the night camped high on the plateau at the remote homestead of a rooibos tea farm. 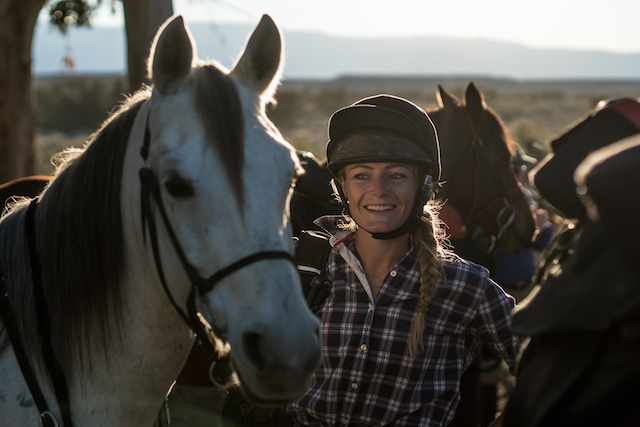 This is a big day in the saddle that takes us out of the Cederberg Mountains and onto the flat plain of the Tankwa. A very early start will have us riding into the sunrise amid the low dense fynbos on the long gentle downhill slope of the plateau. The landscape becomes increasingly arid before the abrupt drop into the canyon of the Doring River. 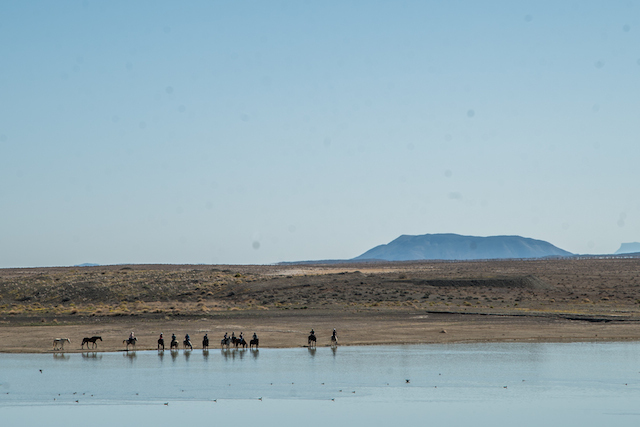 In the oasis offered by the confluence of the Tankwa, Tra-Tra and Doring Rivers we rest, water and let the horses graze before the final push from the farmsteads at Eilandsvlei across the Tankwa plain. On day our rest day we will revel in our isolation in this stark but beautiful landscape at the Tankwa Tented Camp owned by Henk van Zyl of Zulu Overland, the company providing our back-up operation. Henk is not only passionate about the Tankwa but also the creator and lord of a wonderland created from the detritus of the Karoo. It is a magical place! 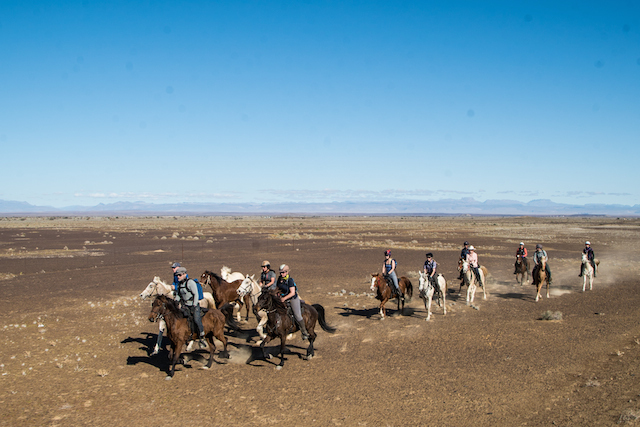 Day 7 has us continuing across the Tankwa plain, following the course of the Tankwa River, past the impressive Oudebaaskraal Dam to the farmstead at the old wagon crossing at Bo-Wadrif. 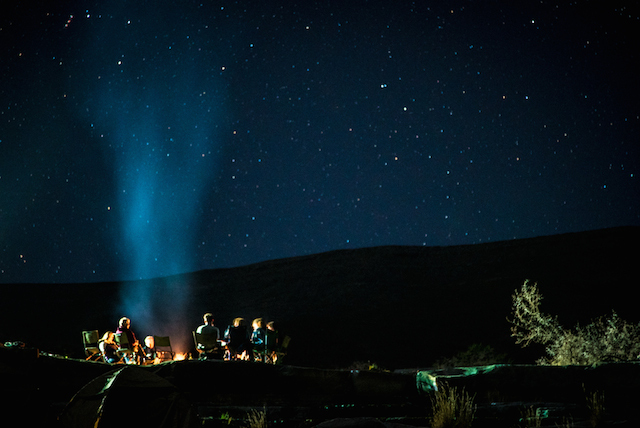 We spend the night camped beneath the imposing Roggeveld Mountains, the escarpment separating the Tankwa from the Great Karoo. With the Roggeveld Mountains looming we climb 900m vertical meters up the formidable Ouberg Pass, our gateway to the plateau of the Klein Roggeveld. Having camped close the escarpment, with incredible views of the flat plain of the Tankwa stretching back toward another spectacular sunset, we head across the Klein Roggeveld toward the isolated hamlet of Sutherland; the southern hemisphere’s premier stargazing site. The rest day can be spent taking in the special charms of Sutherland, famous for being home to the SALT, the largest optical telescope in the southern hemisphere, and the coldest town in South Africa (the average low temperature for August being -1C and a high of just 14C!). For stargazers, the South African Observatory offers fascinating day and night tours where the SALT scans deep space, witnessing the birth and death of planets, gazes into distant galaxies and records the scale and age of the universe, stars and quasars billions of light years away. If you felt small and vulnerable crossing the dry plain of the Tankwa, witnessing our universe first hand will make you feel tiny indeed. 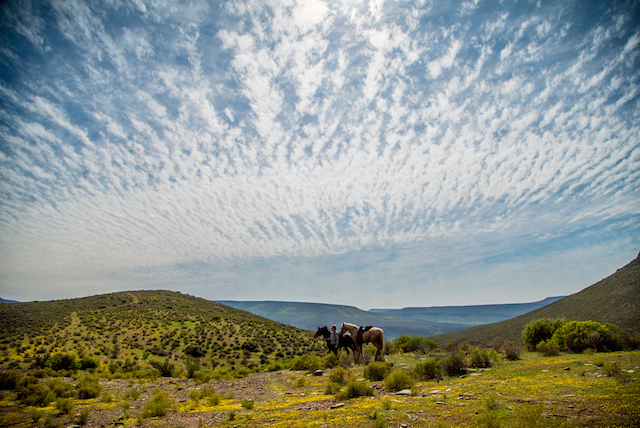 On day 11 we turn south across the Klein Roggeveld, heading toward our final destination of Matjiesfontein. Having once again camped on the edge of the escarpment, we head down the dramatic Rooikloof Pass to camp alongside the upper reaches of the Tankwa River. On our penultimate day in the saddle we enter the sharp scattered foothills and tight fertile valleys of the Koedoesberge. We steadily climb over 600 meters in altitude during the course of the day to reclaim much of the altitude lost during our decent of the Rooikloof Pass and spend the night camping alongside the dam of a local farmstead. 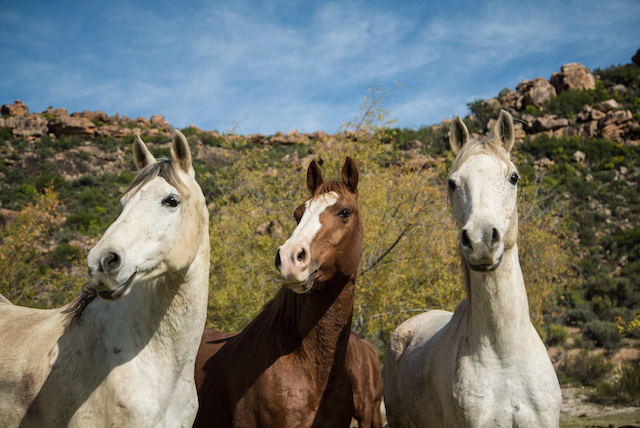 Our last day of riding takes us out of the tight network of barren hills and narrow valleys to historic Matjiesfontein, an oasis in the Little Karoo and an outpost of Empire from a bygone era. Established in 1884 by Scottish railwayman James Douglas Logan as a fashionable Victorian health spa, Matjiesfontein is well known for its historical buildings particularly the Lord Milner Hotel which will be our luxurious digs for the night, a sharp contrast to the previous two weeks spent bivouacked next to the camp fire and our faithful truck, all be it with the comforts of a bell tent, stretcher and sleeping bag. We say goodbye to our adventure and Matjiesfontein with the reasonably unique option of catching the train to Cape Town, an alternative to a 3 hour road transfer.